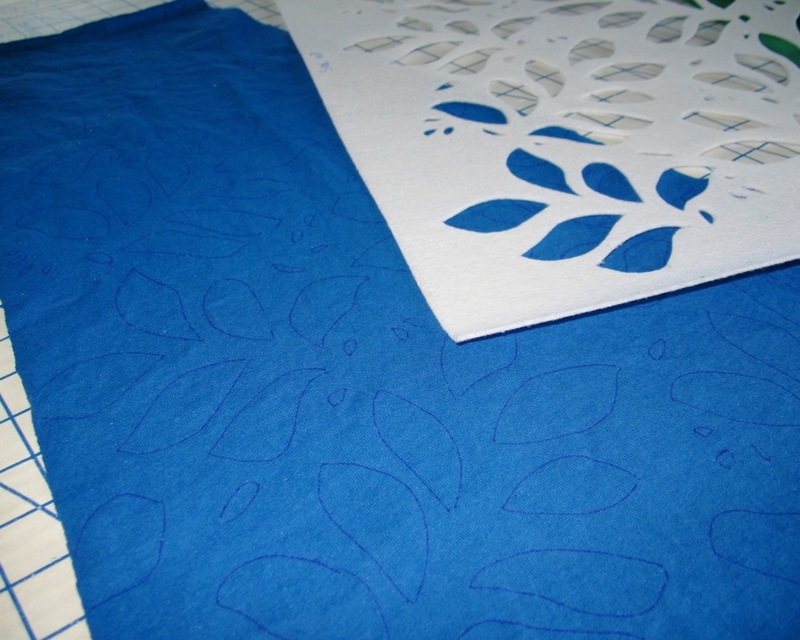 After testing the pattern, making the stencil, and dying the fabric, it was time to get started with the fun part . . . lots and lots of hand stitching! 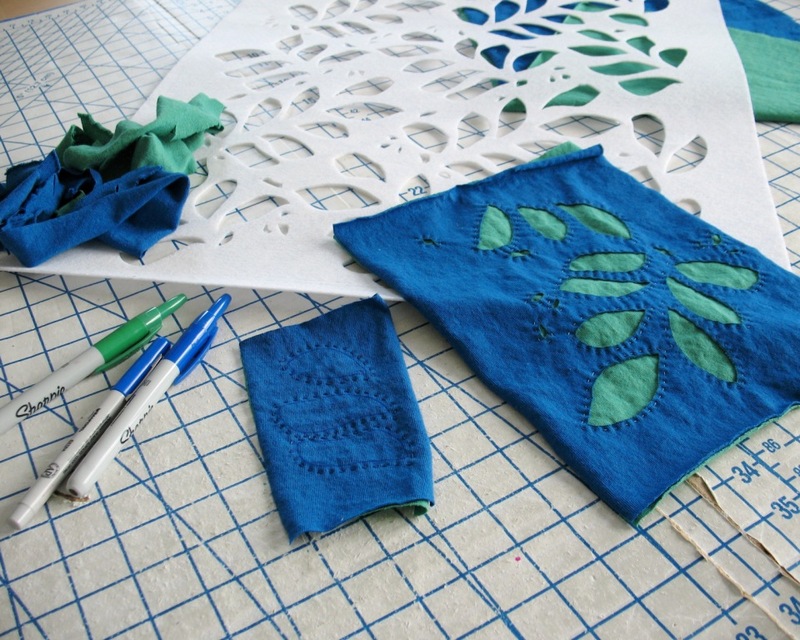 There are many different ways to stencil fabric, but I knew I did not want to use fabric paint. For one, it is something else to purchase. Also, I do not like the idea of working with a fabric that has been painted. It seems to me it would get stiff and difficult to hand sew. So I went the lazy route . . . a Sharpie pen. After digging around in a desk drawer, I came up with a blue fine tipped pen. I was concerned that it would not show up well on the fabric, but it is clearly visible, even without the benefit of daylight. And it glides across the fabric more easily than the thicker tipped Sharpie. I started my swatch with two small pieces of the dyed cotton jersey. 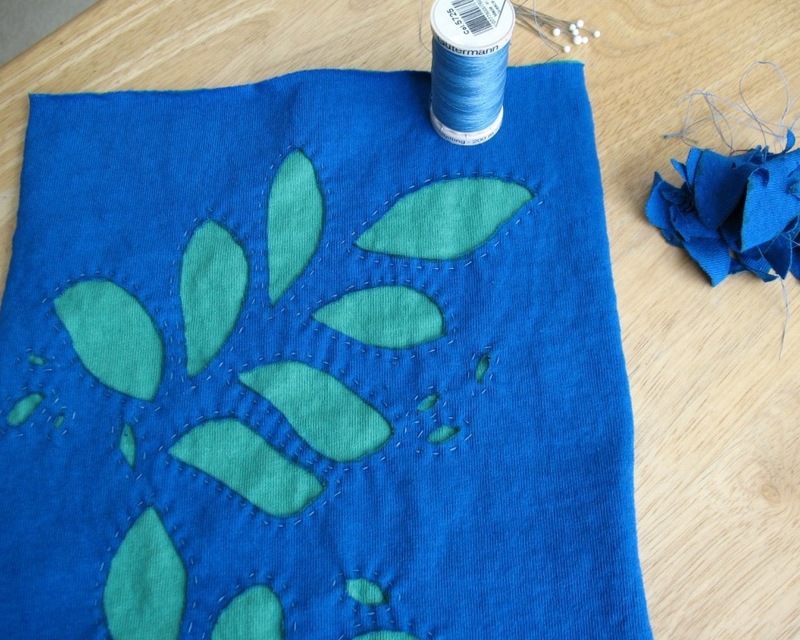 I have quite a few spools of hand quilting cotton thread and found a blue I thought would look nice with my fabric. After looking at my sample in the daylight, I decided I did not like the color of the thread - it looked too gray on the bright blue fabric. And I am making a note: I am going to have to find different scissors to trim off the top layer. For my samples, I used a small pair of embroidery scissors, but my fingers started to cramp after a few minutes. My other small scissors are not up to this task. Time to cut out my skirt pieces! 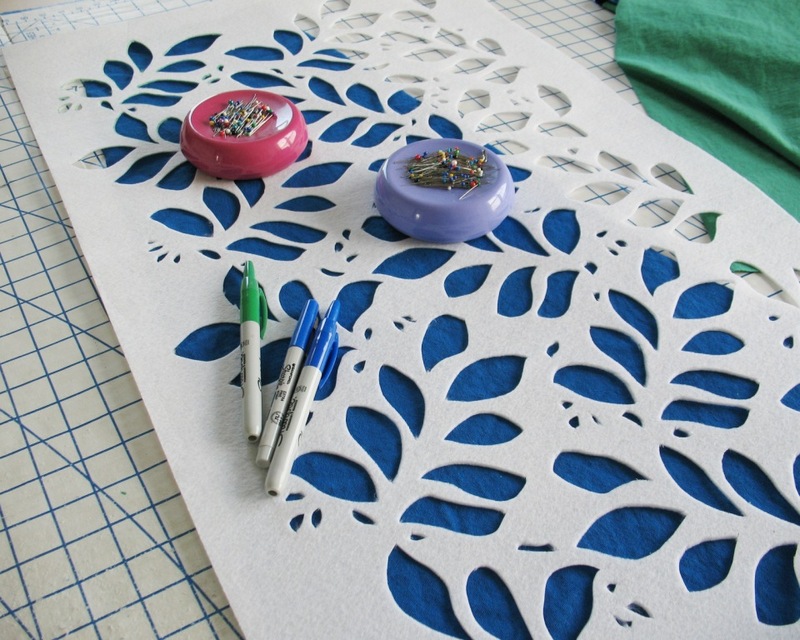 Once each piece was cut, the next step was to apply the stencil. 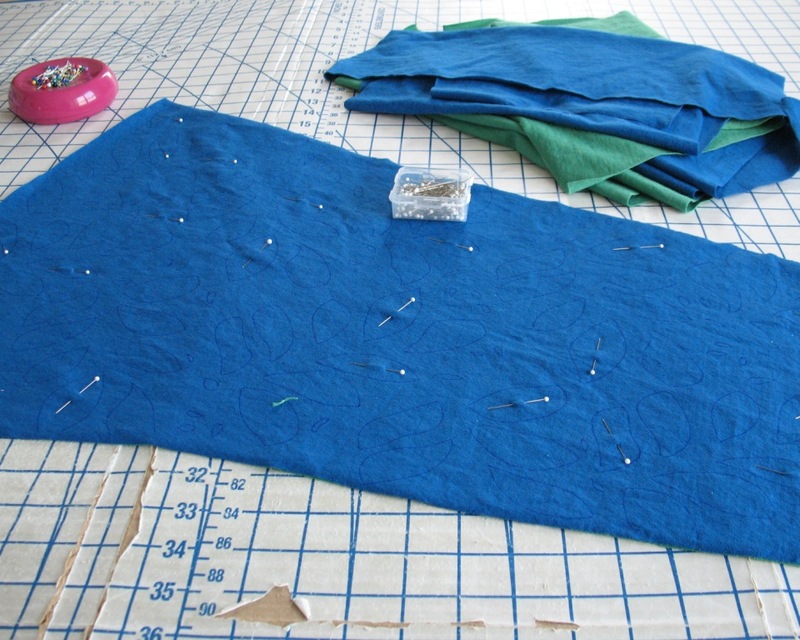 The stencil was placed over the fabric and held in place with magnetic pin holders. 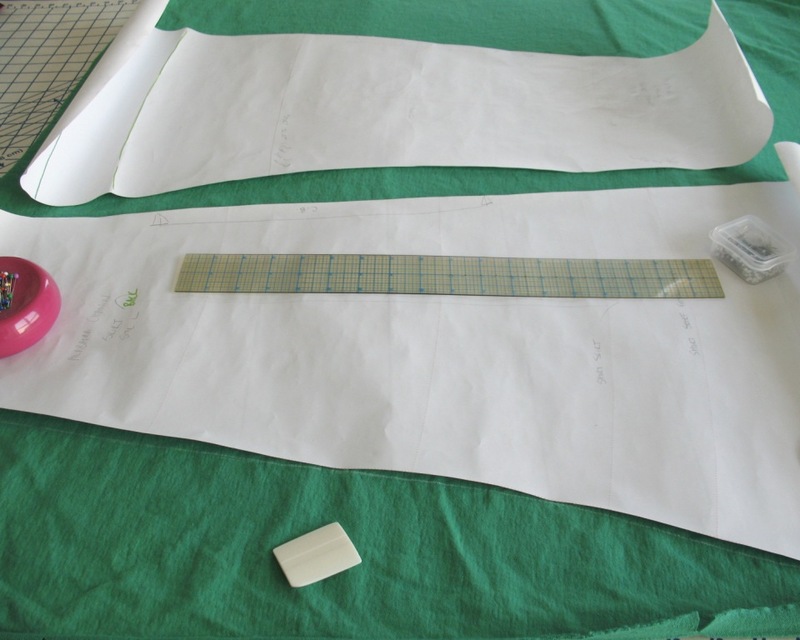 I decided to orient the pattern along the grainline of the fabric. Starting at one end, I traced each cutout with my Sharpie pen. This went very quickly. The Pellon is thick enough to keep the pen on track and makes for easy tracing. Next, the stenciled fabric was matched back to its plain jersey counterpart and pinned together. Thankfully, this fabric like to stick to itself, so I went easy with the pins. And now I can look forward to many hours of hand sewing! I am very excited!! I'm following your journey with great interest. I've just ordered a book myself and am looking forward to lots of lovely hand sewing as well. I've made a couple of these skirts and if you are sensible (let's say you hate tags) I recommend hiding the knots, they are annoying (at least for me). I also used sharpies, not only to mark, but to give color on the outside. Have fun! This is looking great so far -- can't wait till see it finished! Laura - I am having such a blast watching what you're working on. I signed up for the Alabama Chanin Craftsy class a while back and purchased a kit. I certainly wasn't brave enough to dye my own fabric, I haven't even had time to start sewing. So, I longingly look at the kit on my peg board and I live vicariously though you. You're doing a fabulous job! You should definitely play with that kit! 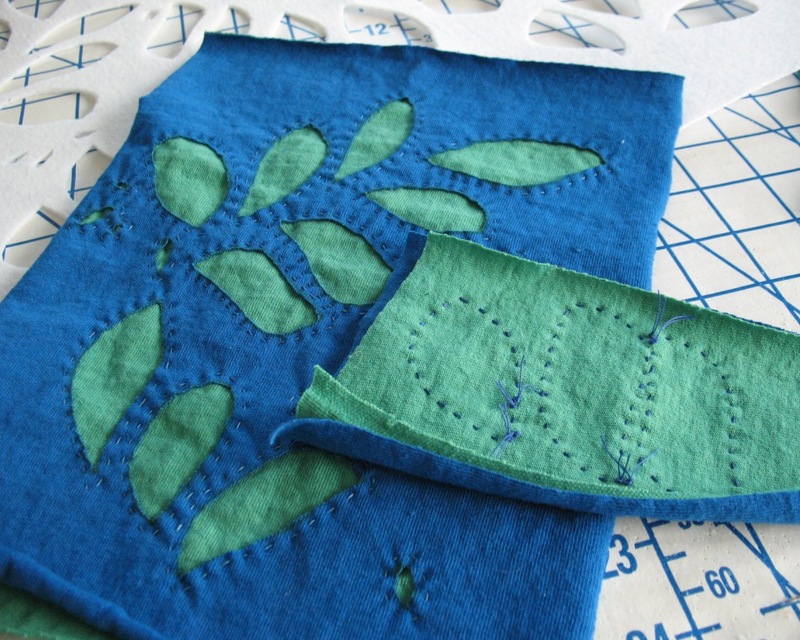 Once you get things cut out, the hand sewing is a great project to have one hand when you get a few minutes set aside for creativity. It is a bit like knitting in that way for me. It's looking so great!! 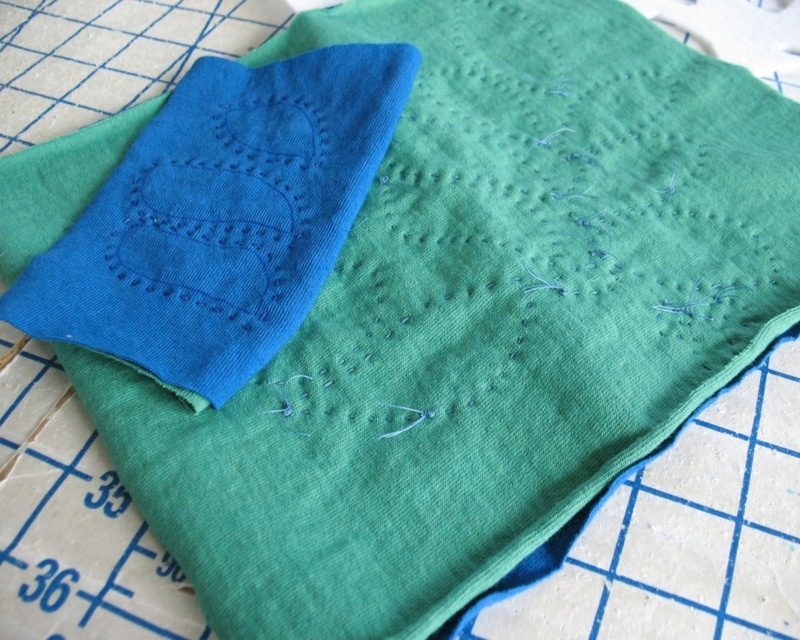 I love the handstitching that these projects entail, so relaxing and slow. 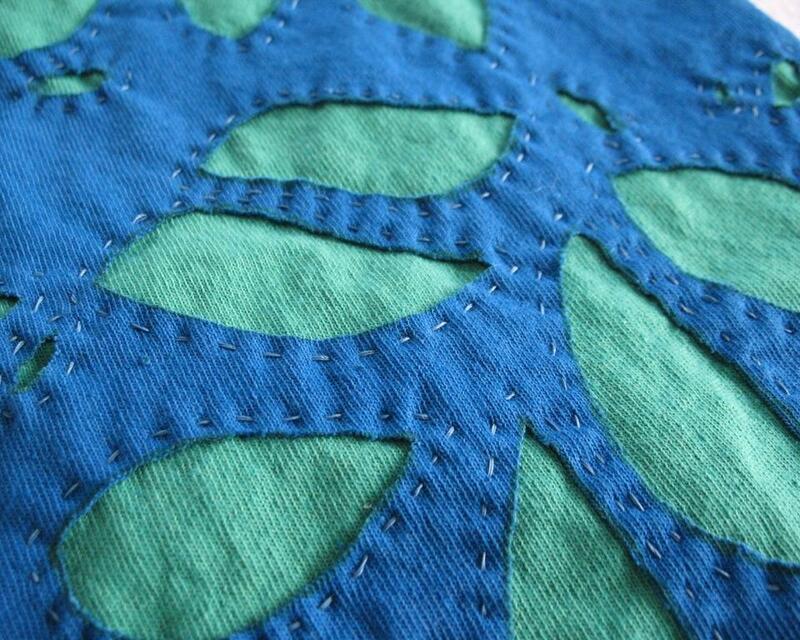 I've been using handstitching for other knit and woven garments now too. Oh good! Hooray for hand sewing! The duck billed applique scissors work really well for this; I confess they are my at-hand snips now (I know, should use the cheaper cuticle ones for thread snipping....). I have had some spectacular fails with this technique in the washing (after wear) phase (enormously ugly unraveling at cut edges). I am thinking the next time I am going to test wash a swatch before I invest the time in the larger project. 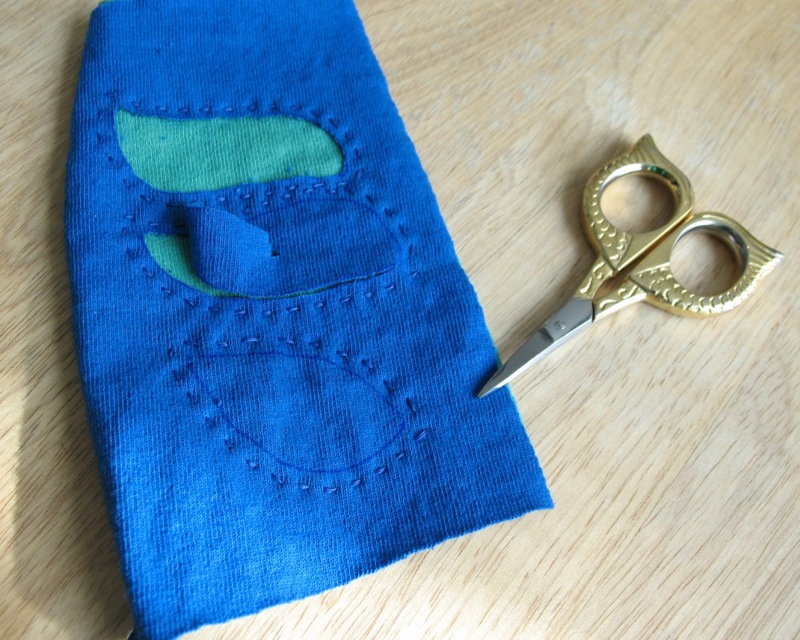 I have wanted a pair of applique scissors for some time, so I may just have to invest. Did you hand or machine wash the garments? I know that Alabama Chanin says machine washable, but I never like to put my hand made garments in the wash . . . especially something special! Looks very pretty so far, and I love color combo. I've become a convert to Kai shears, which are super sharp. They make several sizes of small trimmers. I keep hearing the name Kai when scissors come up lately . . . I will have to check them out. Thanks for the suggestion! Laura this is a lovely, interesting and inspirational project. Thanks for sharing the process. Indeed, thank you for sharing all your projects and nudging me into refreshing some of my rusty slow sewing skills. 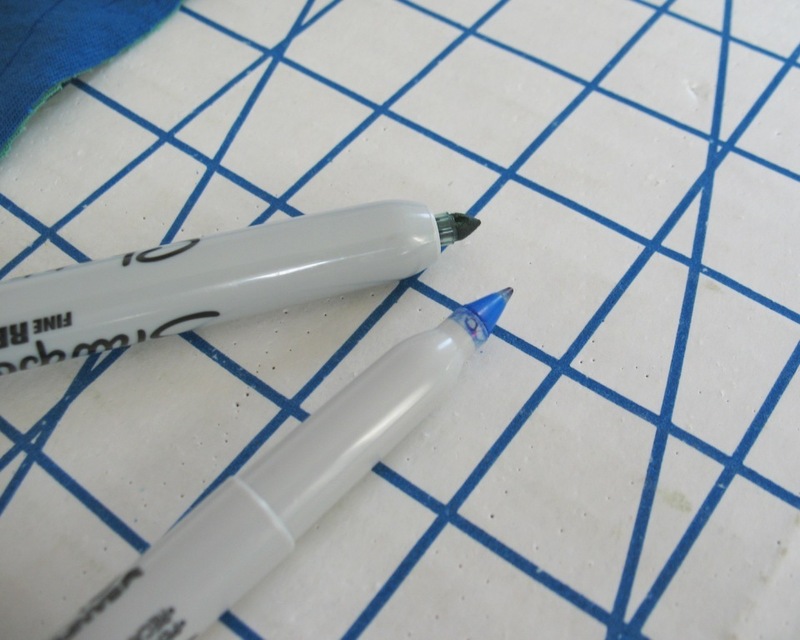 Fine markers - Have you tried Frixion pens? They are marvelous for precise and accurate marking.. Apply some heat from an iron (with or without steam) or hairdrier or laying on a warm radiator and the marks disappear. Once washed the marks usually disappear permanently. Even so, as with anything it's always wise to test before applying to the real thing. 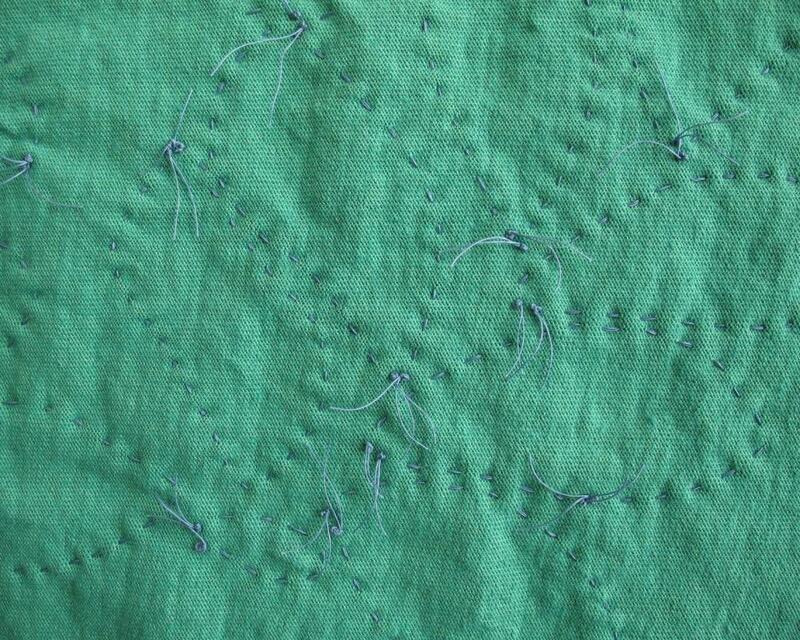 If a mark is accidently erased by pressing, it's usually possible to restore it by placing the fabric in the freezer. These pens are great for magic writing fun with young children. What's not to like? I have heard of Frixion pens, but have never tried them. I will definitely keep my eyes open next time I am in the writing utensil section of the craft store! I have the 3.5" size. Just more things to buy!! Testing Testing, 1 . . . 2 . . . 3 . . .